THIS IS A SINGLE FAMILY HOME - NO DUPLEXES IN SIGHT! SINGLE STORY - NO STEPS! Pack your bags and enjoy Florida's most beautiful area! You don't need a passport to the American Caribbean - The Florida Keys! This home is a spacious and beautifully decorated ground-level pool home on the "preferred" side of the 100' wide clear canal. 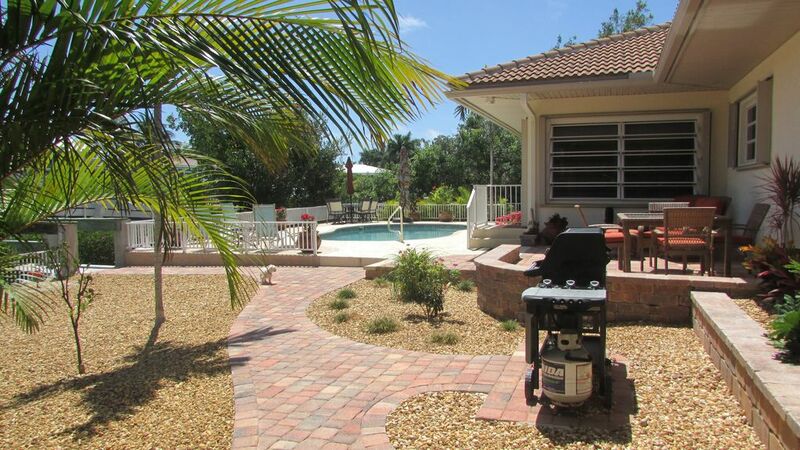 This 3 bedroom and 2 bath home is clean and tastefully decorated for your relaxed vacation in the Key Colony Beach. A well stocked kitchen for the cook in the family and a largeTV in the great room for the couch potatoes. Keep your boat outside the door at our large STEPDOWN dock with water, electricity and fish cleaning table and bait freezer (in garage). Parking for your boat trailer on premises. There's a gas grill to prepare your fresh catch! You can enjoy your own pool right outside. You can also access a private beach (Inch Beach) just a short walk away. An ocean view is out the front window. The open living area has a reclining sofa and a 50" internet TV. It is open to the kitchen, dining room and sunroom. The master bedroom has a private bath with dual sinks and a shower. It is furnished with a king bed and TV. The first guest bedroom has a king bed also and 26" flat panel TV and the 3rd bedroom has a king bed and a 32" flat panel TV. Our sunroom also has a queen sleeper sofa and 32" flat panel TV. And of course we have Wi-Fi. Key Colony Beach is only 2 hours from Miami and only 1 hour from Key West. It is centrally located in the Keys so it's just a short trip to visit the other islands, and the 7 Mile Bridge is just minutes away. We are a couple from Ohio who started vacationing in Marathon in the mid-90's. Then we discovered Key Colony Beach and knew it was the place we wanted to have a vacation home. We bought our first home in January of 2001 and have traded up a couple of times to get to this home where we are going to stay! This home was exactly what we were looking for in a vacation home. We wanted single story because how many times have you gotten in the boat and forgotten something and have to run back to the house? Plus, we aren't getting any younger. It has an open floor plan, large master and rooms large enough for guests. Of course there is the dock where we keep our boat and still have room for another 30' boat. We love the pool and have made many, many upgrades to the backyard and the pool area. The neighborhood and proximity to Sunset Park, Inch Beach and all that Key Colony Beach has to offer sealed the deal for us! Privacy! This home has no neighbors to one side and the other side has a home with lots of palms and plantings. We added a row of Areca Palms to provide extra privacy. We have a large yard and driveway so there is plenty of room for your trailer (1 allowed per property in KCB) and extra vehicles. Open water can be seen from the living room. We are on a 100' wide canal with a dock that can handle a 32' boat max. KItchen Towels Bathroom Towels Beach Towels are here - can't guarantee they will be here for your stay because they seem to disappear. There are 2 in case someone like me wants decaf. Since this is our vacation home also, the kitchen is stocked with plenty of dishes and utensils for prep and meals. Everything you need to prepare and serve a meal is in this kitchen. There are granite countertops and a breakfast bar with 4 stools. There are two dining tables, one inside and one in Florida Room. They are nearly side-by-side. The kitchen also has 4 barstools. There is a step-down dock for easy in and out of your boat. We have water and a fish cleaning table also. We have a large dock, but we keep our boat on a lift at the dock. There is still room for a 32' boat at the dock. I stayed at this house with my family (kids ages 6,5, and 3) between Christmas and New Year's. Everyone enjoyed the home. The home is well taken care of and decorated beautifully. The home feels very new and clean. The owners take very good care of it. Having access to a private beach two blocks away was great. The pool was heated and extremely warm (92 degrees when outside temperature was 81 degrees). Honestly, I can't think of a thing wrong with the home. The neighborhood where the home is located is very safe and upscale. We would definitely stay in this home again. It's our goal to provide a clean and comfortable vacation home for our guests and we are happy you enjoyed it. The neighborhood is very safe and surrounded by wonderful homes. Since this is our home for six months out of the year, we do updates regularly to make it a great place to stay. The home was clean, the kitchen extremely well equipped. Puzzles and books were there as well. Ann, the owner, was a gem to work with. Great location. Great property. Great vacation. Would have stayed longer!! Thanks Wendy for the great review! It’s our goal to make this a home you’ll enjoy while you are there and want to return in the future. Hope to hear from you again soon! This house was just PERFECT!!! We have been coming to the Keys for many, many years and must say this house was the most "feel-like" home and well-taken care of that we have rented thus far. Very spacious and open, worked perfectly for 3 couples and a baby. Also, the pool size was very enjoyable as many in Key Colony are more like hot stub size. The dock/cleaning station was plenty adequate for our 26ft Cobia. The Owner was most responsive and hospitable. You can truly tell they take great pride and care of their second home. Highly recommend renting this PURE PERFECTION! Thank you Tammy for your glowing review. The home-like feeling is because it is our home for 6 months of the year. Unlike a rental which is on the market as just a income property, our house has our stuff in it. Open the cabinets and they are full of plenty of dinnerware, cookware and all you need. Amazing!!!! Amazing house, amazing location, amazing homeowners to deal with. Just amazing!!!! Thanks Brad - Hope to hear from you again. - Coffee Shop (1) also has ice cream! to enjoy during your stay.